Passenger supports multiple programming languages, of which Ruby is one. Passenger can also serve multiple applications at the same time (it is multitenant). The Ruby on Rails framework provides a builtin server tool, which you can access with the rails server command. The "rails server" is not an application server by itself, but just a small wrapper that launches your application in an application server. This is why people do not use "rails server" in production. They use an application server – such as Passenger – directly. "rails server" uses Puma by default as of Rails 5. If you add Passenger to your Gemfile, then "rails server" will launch Passenger instead of Puma. You can also choose to launch Passenger directly. When you deploy your web app to production, there are all sorts of components involved. You may have heard of Unicorn, Puma, Nginx, Apache and Capistrano. Passenger replaces some components, while collaborating with other components. In a typical production stack, one would use Nginx or Apache as the web server, Passenger as application server, and Capistrano as release automation tool. 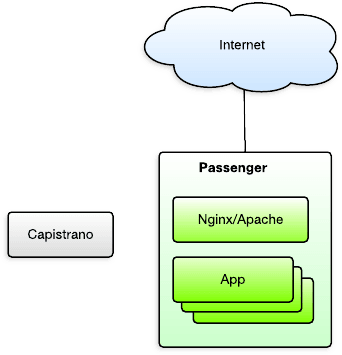 Passenger integrates with Nginx or Apache and manages the application and its resources. Passenger integrates with Nginx/Apache, allows the app to speak HTTP and manages the app's processes and resources. Capistrano automates releases. Nginx and Apache are web servers. They provide HTTP transaction handling and serve static files. However, they are not Ruby application servers and cannot run Ruby applications directly. That is why Nginx and Apache are used in combination with an application server, such as Passenger. Application servers make it possible for Ruby apps to speak HTTP. Ruby apps (and frameworks like Rails) can't do that by themselves. On the other hand, application servers typically aren't as good as Nginx and Apache at handling HTTP requests. The devil is in the details: Nginx and Apache are better at handling I/O security, HTTP concurrency management, connection timeouts, etc. That's why, in production environments, application servers are used in combination with Nginx or Apache. Capistrano is an application release automation tool. When releasing a new version of your web application, there are actions that need to be performed, such as uploading your application code to your servers, running a command to install your gem bundle, restarting processes, etc. Capistrano allows you to automate these actions. Capistrano is not a server that provides HTTP transaction handling, so it does not replace application servers or web servers. Instead, you are supposed to use Capistrano in combination with them. For example, Capistrano scripts typically contain instructions to restart the application server after a new application version has been released. Unicorn and Puma are alternative application servers. Passenger replaces Unicorn and Puma. Passenger's feature set is very different from those of Unicorn and Puma. In particular, Passenger has a stronger focus on ease of use, integration with other components, automatic management and enabling problem diagnosis. For example, Passenger can integrate with Nginx and Apache in order to reduce setup work, and provides tools for easy problem diagnosis. The Standalone mode is what you've experienced in the Quickstart tutorial. You start Passenger through the passenger start command. In this mode, Passenger behaves somewhat like "rails server". To run Ruby apps on Passenger, you must already have Ruby installed. Passenger does not do that for you. Passenger does not care how you install Ruby though; you sometimes just need to tell Passenger where Ruby is. Having said that, the Passenger Library contains excellent documentation on installing Ruby during a production deployment. Passenger does not transfer the application code and files to the server for you. To do this, you should use something like Capistrano. Passenger assumes that the application code and files are already on the server, and does not care which tool you use to make that so. Passenger does not install your application's dependencies for you. That job belongs to Capistrano and Bundler.